In 1934, Tohoku University Professor Hikosaka Tadayoshi’s “atomic physics theory” was released. Hikosaka pointed out the huge energy contained by nuclei and the possibility that both nuclear power generation and weapons could be created. In December 1938, the German chemists Otto Hahn and Fritz Strassmann sent a manuscript to Naturwissenschaften reporting that they had detected the element barium after bombarding uranium with neutrons; simultaneously, they communicated these results to Lise Meitner. Meitner, and her nephew Otto Robert Frisch, correctly interpreted these results as being nuclear fission and Frisch confirmed this experimentally on 13 January 1939. Physicists around the world immediately realized that chain reactions could be produced and notified their governments of the possibility of developing nuclear weapons. The Japanese program to develop nuclear weapons was conducted during World War II in response to the perceived threat of its enemies (principally the United States) obtaining such a weapon first and using it against Japan. 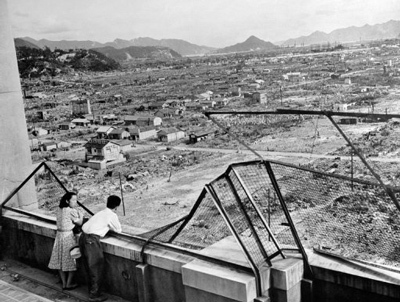 Like the German nuclear weapons program, it suffered from an array of problems, and was ultimately unable to progress beyond the laboratory stage before the atomic bombings of Hiroshima and Nagasaki and the Japanese surrender in August 1945. Today, Japan’s nuclear energy infrastructure makes it eminently capable of constructing nuclear weapons at will. However, the de-militarization of Japan and the protection of the United States’ nuclear umbrella have led to a strong policy of non-weaponization of nuclear technology, but in the face of nuclear weapons testing by North Korea, some politicians and former military officials in Japan are calling for a reversal of this policy. While there are currently no known plans in Japan to produce nuclear weapons, it has been argued Japan has the technology, raw materials, and the capital to produce nuclear weapons within one year if necessary, and some analysts consider it a de facto nuclear state for this reason. For this reason Japan is often said to be a “screwdriver’s turn” away from possessing nuclear weapons.